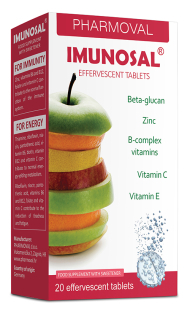 Imunosal® effervescent tablets with beta-glucan, zinc and 10 vitamins for children over 6 and adults. Adults and children over 12 years: 1 effervescent tablet on an empty stomach, children from 6 to 12 years: ½ effervescent tablet a day. Dissolve one tablet in one glass of water (2 dl). If you have problems with sensitive stomach, take the recommended dose with meal or consult your pharmacist or doctor. 2) Thiamine, riboflavin, niacin, pantothenic acid, vitamin B6, biotin, vitamin B12 and vitamin C contribute to normal energy-yelding metabolism. 3) Riboflavin, niacin, pantothenic acid, vitamin B6, folate, vitamin B12 and vitamin C contribute to the reduction of tiredness and fatigue.